My work situation both at Gävle College and Karolinska Institute have recently changed. I left my professorship in Public-Health Epidemiology to became Professor of International Health in Gävle, and to become Research Group Leader at the Karolinska Institutet in Stockholm. Namely, my former research team within the Safety Promotion & Injury Prevention Research Group become now a research group of its own at KI/Social Medicine: The Research Group of International & Cross-Cultural Injury Epidemiology, at the Div of Social Medicine, Dept of Public Health Sciences, KI. "Anknytningsbeslut" till Karolinska Institutet as "ledare för forskargruppen Internationell och transkulturell skadeepidemiologi" as well as the formal agreement in which the Dept of Public Health Sciences engages me as "Forskare/professor" was signed by the Department Head and the Division Head, professors Danuta Wasserman respectively Leif Svanström. The changes above obliged me to edit anew my presentation - the so called profile - in this blog. By doing this I found myself writing down with great passion - beyond what I am professionally - who I am as homus politicus, where I do stand ideologically, or in other words what is the philosophical background of the positions I hold here. I felt to sum up what do I mean with "leftist liberal" or "conservative anarchist". This also with the hope to avoid confusions or wrong identifications with self styled liberals of the cemented right, or with self indulged leftists doing as right-wingers. Or worst, doing the job for them without even noticing. And finally, I again could not stop some words about institutionalized social cliché behaviours. What do I mean with Leftist liberal with some quite conservative anarchic values? I came to Sweden as a political refugee – helped out by Amnesty International – after I have participated 1973 in the uprising against Pinochet’s military takeover and held captivity as “prisoner of war” at the Prisoners Camp of Quiriquina Island in Concepción, and also at the Stadium. 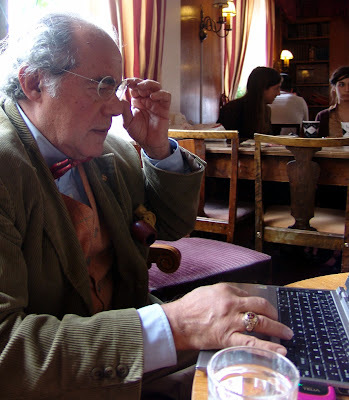 Thereafter I was a main witness at the Bertrand Russell Tribunal on the atrocities of the Chilean fascist regime, in Rome 1974, and also member of the scientific committee of that Tribunal together with Lelio Basso, Linda Bimbi, and Gabriel García Márquez. 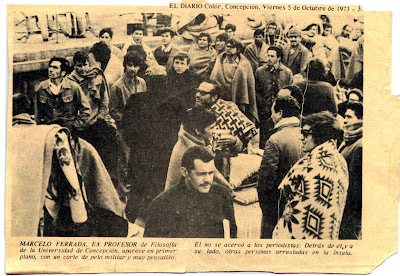 At that time of the military coup I was professor at the University of Concepción. 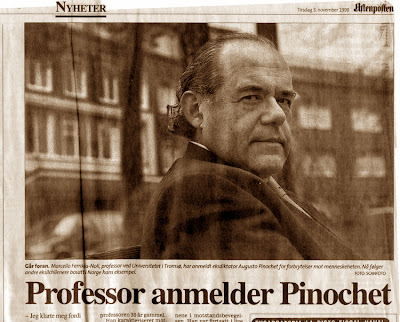 Later in 1998 I initiated in Norway the legal process for the extradition, detention, and trial of General Augusto Pinochet (see here my article in Brännpunkt, SvD. Other articles on Pinochet here (Bring Pinochet to a European Tribunal in Stockholm) and on other items here. I am also a co-founder of the Chilean revolutionary movement MIR, and co-author – with Miguel Enríquez and his brother Marco Antonio – of the first “Tesis politico-militar” approved in the foundation of MIR in 1965. Other facts of my political life in the revolutionary years, in Political biography 1943 - 1973 . In the first place, I have always been on the side of the poor and the oppressed. In fact, I have got 2005, rather close to the eve of my academic livelihood, an international academic award based in the verity that my research has permanently taken up the whereabouts of the less privileged in society, elsewhere in the world. Taking side for the “deprived” is precisely what makes me be against of any policy that – even if not intended – neutralises basic human capacities of individuals in fighting for a creative role in society. I think that for the most the Swedish Left, and also the nationalistic Miljöpartitet has been deceived in these aspects by a hyper rightist ideology from within. Burn-out (In Sweden called utbrändhet or utmattningsdepression) is a fashionable diagnose, reported mainly by well situated or upper-class individuals, non medical verifiable and with no proven scientific ground. See here my analysis on the socio-economic and education factor in the reporting of job related stress, based in our research at the Karolinska Institute, and which shows a clear overrepresentation of the privileged in society. Read this Mona Salin, Lars Öhlin, Peter Eriksson, Wanja Lundby-Wedin, Sture Nordh! The purported epidemiology of burn-out (utbrändhet, utmattningsdepression) is clearly exaggerated in Sweden with help of administrative prevalence (number of sick leaves which in the main are based in the individuals' own wishes or report to doctors). Authentic epidemiologic prevalence of burn-out (utbrändhet, utmattningsdepression) which can be related the the factual amount of individuals truly clinically affected, does not exist in Sweden. I do believe in the separation between the individual and the state. Not in the sense of “against” the state but in the sense of “independent” from the state as much as possible. “Together we are strong” still applies, even if we mature away from the notion of maternal State (bidrag-stat) and leave to the state the caring of the nation, not of the individuals. I am against the state-induced civil passivity. The state university, the public service, the guaranty of objective judgement, that is one thing - and which I warmly support. The manipulation in the name of public interest to serve others interests through the detrimental of individual integrity, is another thing. I am for Swedish neutrality and non-alignment (like the socialists) but I support the cuttings in defence (like the Moderate Party now does), and unlike the socialists I am against a growing Swedish military industry aimed to sell weapons for the mass-killing of poor people such as in Iraq. I am against any Sweden approach to NATOand also against any involvement of so called Swedish intervention task-forces in Afghanistan - such as both rightists and socialists warmly support and inplement - or elsewhere the commitment is not sanctioned by United Nations. I am for military conscription (värnplikt) and I support the idea that every citizen of all gender and adult age has to learn how to manage weapons in case a military imperialist aggression is perpetrated in the nations’ soil. I also believe that the most effective strategy in defending Sweden against eventual occupations forces is not the one based in JAS or super sophisticated and expensive weaponry, but in a political and military resistance in which a partisans’ war of attrition, or guerrilla warfare – consolidated by a high moral of brotherhood among native and immigrant Swedes - should be the main input. The yearly training programmes should take this into principal account. Armies should not be exclusively "professional" on the sense of surrogates of people. In fact, only "people in arms" would secure the national commitment. The institution of military conscription (värnplikt) should be instead enhanced - with the main training strategy as described above - to significant increased contingents of men and also women. Every adult group-age should be part of that strategy. I am for EU, and for EMU, and for everything which may entail the diminishing of frontiers, checkpoints, and administrative barriers among the people, the human beings of nations who wish to coexist in creative peace and healthy competition with each other. I warm welcome Turkey to EU, and provided the treatment to minorities would meet at least the standards of democracy as defined by EU. No fundamentalist government should be allowed in the EU and this should be valid even for Denmark in case the supremacist party makes it to power. I am not only a secular atheist, but militant against the influence of church and religion in education and science. See my essay Theses on the cultural premises of pseudoscience here. I am for freedom of the press, but against the vulgar, unmannered initiatives of - misusing that freedom – aimed to insult others faith symbols, like in the Mohamed caricatures issue. See here Making compatibles Freedom of Speech and banning of uttered offences. I distaste the chauvinist atitudes and apartheid policy of the rulers in Israel, and I am in general a supporter of the Palestinians’ cause. But I am for accepting the existence of a (non beligerant) Israel state, because they are also a nation - as well as the Palestinians are - and I support the civilized formula of the State of Palestina coexisting in peace with the State of Israel. See my writing The one & only reason for recognizing Israel. I support free establishment of enterprise and non-state owned cooperatives, and actually I wrote 1979 an essay at the Dept of Philosophy in Stockholm in which I humbly believe I proved Marx was wrong in his contention around Morgan on that private property of means of production did born after society divided in classes. But I am staunchly against monopolies and cartels. And I do not see any difference between the monopoly exercised by the state (Vattenfall, etc) which are supported even by the socialists, and those in private dominium attacked by them. I am for the right of young people and poor students to freely download files from Internet. In fact, I am against the principle of private property of intellectual work. And I am for the fight towards securing the private life of individuals and at the same time enhancing the open society (Item in the Piratpartiet's manifest of 2006). I favour a political debate only with arguments of facts. I despise personal attacks. If the Swedish Prime Minister Reinfeldt announces cuttings in the defence budget, my breakfast coffee tastes as a yesterday's croissant when reading that the oppositional socialists expressed that Reinfeldt “obviously is totally disinterested in a defence strategy for Sweden”. That he or his Finance Minister Anders Borg are not interested in the first place helping the profits of the Swedish Military Industry - which many socialists in fact support - does not make them deprived of interest in a Swedish defence. They just happen to have another strategy on that. Can we not say instead, “I disagree with Reinfelt proposition because of this and that fact, and this is why I have another proposition which is this or that? What particularly makes me “picky” is corruption in the science domain, among my fellow research scientists. The hiding of scientific true, the selling of scientific falsely, the trade of scientific research towards politically correctness and easy “earned” public research grants. Another related issue to pseudosciende is the scandalous agitating from a number of researchers around the theme "Swedish burn-out", without presenting scientific ground for the epidemiology that according to them the "disease" burn-out have in Sweden. 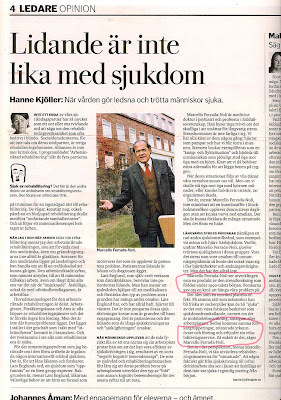 I have not hesitated in pointing this out, for instance in my analysis "Kejsarens utbrända kläder" (Sociologisk Forskning 2004 nr 1) and also in several interviews in the Swedish media, such as in Dagens Nyheter leader article of June the 26th 2006 (click on the picture). More in my blog of July the 9th of July 2006. In my thesis on the Swedish stress monopoly - Stressjukdomarnas monopol / The monopoly of stress...in Sweden - I wrote for instance: "Det nya svenska stressdyrkandet samt den massiva utbrändhetsupplevelsen är inte någon egentlig epidemi utan en ny religion, med några äkta sjuka och många äkta troende i ett tempel med en och annan företagsam månglare i drift"
And in Freud and the Swedish burn-out I wrote <<A tiny but effective superstructure of psychologists, masseurs, professors, fortune-readers, researchers, psychotherapists, alternative "medicine" practitioners, etc, have made quite fortunes by convincing normal individuals in disarray that they - as individuals - suffer of "illnesses" such as "over-occupational guilt", "low-occupation guilt, "grief", "empathy loss", "burnout", "stress", "worries of getting cynical", etc. And of course, that only they can effectively cure them, or "rehabilitate" them - as the trick nowadays has been renamed. I define progress, particularly technology advances, in a complete different fashion than “progress” is generally understood. I mean, what I call vertically developed progress is the new technology and corresponding productions of new, more advanced items by the industrial world. These are devised to replace already well functioning items under the principle of technical obsolescence. We buy a new model of this or that. While this - in the main unnecessarily - replacement happens, vast masses of the world still do not have access to the very first models of such items. My contention is that in many cases we do not need more “vertical” progress. What the world needs is the “horizontal” development of the already acquired progress. That would be a paramount task for industry in the so called developed countries. Did you know that almost half of the worlds adult population has never made or get a phone call? I mean, I advocate for the stop of vertical progress. Let us do a halt there, and expand “horizontally” the production of items already proven as well-functioning. In the optimum, only when all in the world benefit of technological progress would be ethically plausible to devote new efforts for improve niceties of things and go further. I clarify that I am talking here about mass-production and mass-marketing, not on Research & Development. As corollary from above I regard advisable the restoring or repairing good quality products - than besides are unobjectionably more aesthetical value. I have myself found one great pleasure and fulfilment in restoring classic technology. From wooden sailing boats to vintage cars. “Classic” is not concept related to the thing, but to the attitude. To the perennial wish of men to leave things or nature in a better shape than they found it. This leads to the opposite of the classic which is the vulgar. I think Giorgio Armani wardrobe is vulgar, Rolex watches functioning with batteries, vulgar, metallic painting of modern cars likewise. And I suspect any man that mixes Manhattan cocktails without (about seven drops) Angostura bitter. It reveals that they if they are not in the art of mixing properly they might be not either for cooking. And from there not for true gender equality either. Or even worst, perhaps they are deprived of good taste for a sinful life. Only having a good life with poor taste can be worst to it. Well, even if I do not look like such, I am, in the meaning hat I I think equality between genders is an obvious, a self-evident issue. If that has not been fully achieved, we have to struggle for. Besides, I come from a country in which the President is a woman as well as half of the ministers! And I do not want to be in the same package than loud-shouting feminists fighting to "reduce the gap" between men and women's salary. I instead work to abolish that difference. For instance, at my work place I presented already four years ago a proposition in front of the Congress of colleagues and all co-workers, that the entire budget for salaries should make a common pot at the Department, and from that accumulated sum the salaries being re-distributed according to merits and job-tasks, independent of gender. It was majority voted against it, even by several women colleagues. Yet, I still get surprised here in Sweden to hear from time to time the feminist woman - when I hold the door open for her to pass first - exclaiming irritated “don’t you know that here in Sweden we women are capable to open the door ourselves”? By the way I do the same for Swedish men, even if their ties look terrible - the rare ocassions they sport one. A blessing. So, how I use here the above? I intend in this blog to contribute with critical analyses on behalf of true science, individual integrity, and social justice. I am also an artist and share here my views on art & cultural issues. My opinions here are personal and not bounded to family name or the academic positions or institutions I am associated.